Press and Hold the Chime button for two seconds. 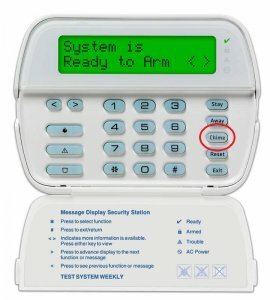 When complete the Keypad will Beep. Press * and then 4. When complete the keypad will beep. You’re done! If you have any more questions about how to use your system, or would like to contact us to ask about how we can service and monitor your commercial or business security alarm system, visit our Contact Us page, or use the form on the right side of this page.